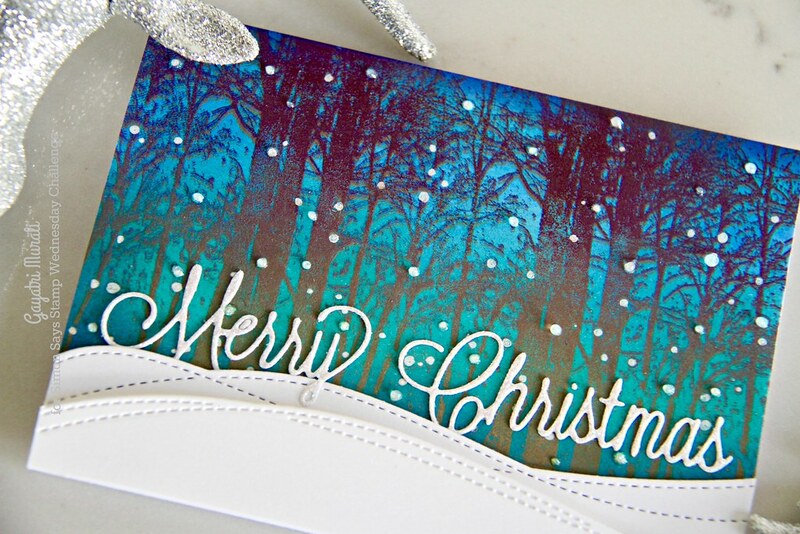 I used Penny Black Snowy Grove cling stamp set to create my background for the card. I sponged a white panel with distress inks in blue shades. I used Tumbled Glass, Salty Ocean, Mermaid Lagoon, Peacock Feathers and Blueprint Sketch. I also dried the panel with heat gun after blending the inks. Then I used MISTI to stamp the Snowy Grove image. I used Mama Elephant’s Hazel, Tutti Fruiti and Plumberry inks to stamp the image on the sponged background. MISTI is awesome tool for stamping especially in this instance because there are more than one ink involved to get gradient colours on the image and also to get even coverage. I moved the image so slightly to get a shadow effect. This adds to the depth of the image. I left the panel to dry. Once dry, I added white dots using Sakura white gel pen and a few with Nuvo White Blizzard crystal drops. I trimmed the panel and added snow mounds using Simon Says Stamp Drifting Stitches die. 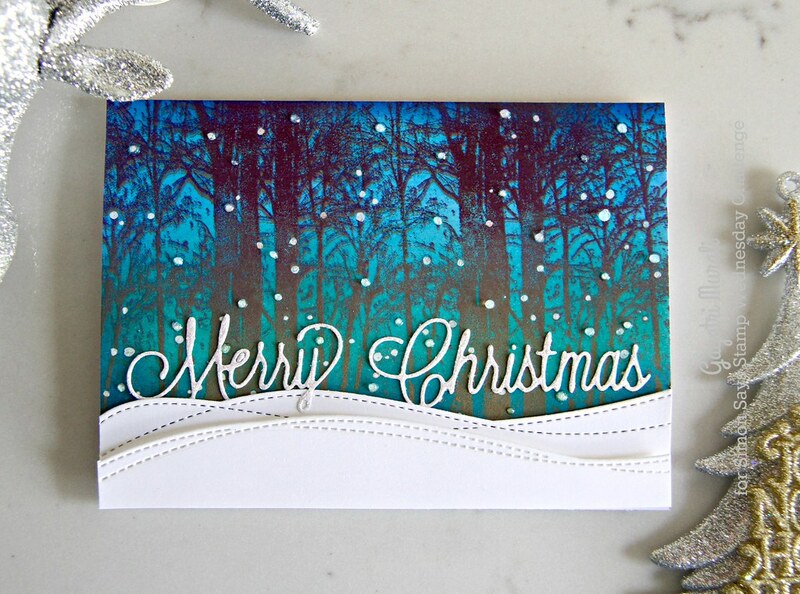 The sentiment is from Penny Black Joyous Wishes die set die cut using white glitter sheet. The background packs a punch in this card. Love it. 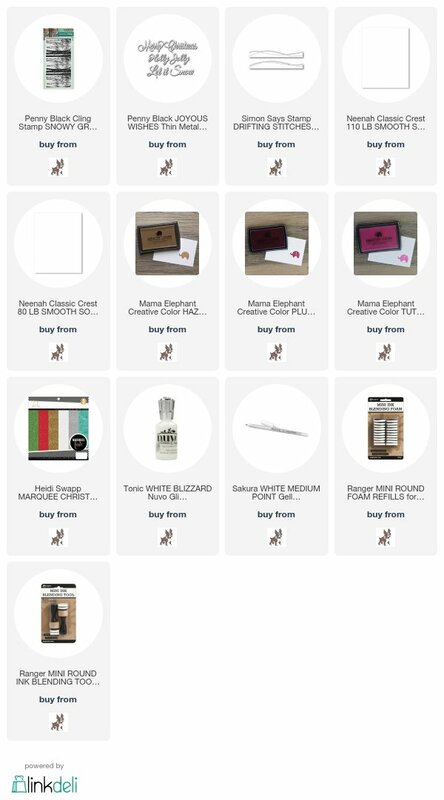 All the items used to make this card are listed below. If you like to pin my card on your Pinterest Board, here is the pin for you. Thanks for stopping by. See you soon with another post. What a serene snowy scene, Gayatri – love your beautiful sky! 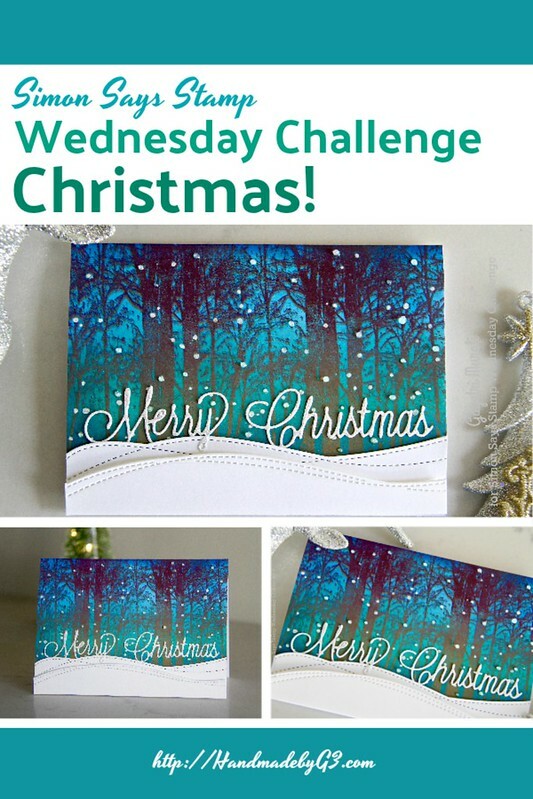 Your card is stunning with the green and blue background and you’ve achieved so much dimension using the hills and drops for snow. This is so pretty to look at. What a gorgeous winter evening scene, Gayatri! I love everything about this! Love your beautiful card. What a fabulous sky. what a stunning card Gayatri. It is incredible.